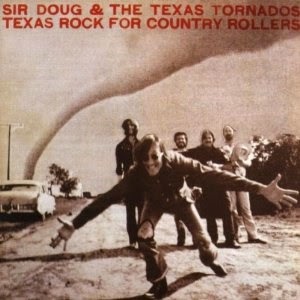 Doug Sahm was a Texan singer-songwriter and musician, best known as founder and leader of the Sir Douglas Quintet. 1976 saw Doug Sahm signed to ABC's Dot subsidiary for one album, produced by Huey P. Meaux (who had produced the Sir Douglas Quintet back in the day). The album was credited to 'Sir Doug & The Texas Tornados' (not the same Texas Tornados he formed in 1989), and his new band consisted of Harry Hess (steel guitar), Artwood Allen (rhythm guitar & harmony vocals), Jack Barber (bass) and George Rains (drums). Both Barber and Rains had previously played with him in the Quintet. The Quintet's organist Augie Meyers also made an appearance, and enginer Uncle Mickey Moody contributed some guitar. The album had a consistent country-rock sound, made up mostly of Sahm originals alongside a cover of Claude King's "Wolverton Mountain" and a medley of Gene Thomas songs. It was a very good album, but perhaps suffered from a bad mix. Thanks a lot for this album of Doug Sahm, very much appreciated, as his music brings so much happiness to me. The write-up for the Dion album, Wonder Where I'm Bound, your write-up states: " Willie Dixon's "Seventh Sun"
Shouldn't that be Seventh Son? Thanks for the Doug Sahm albums!